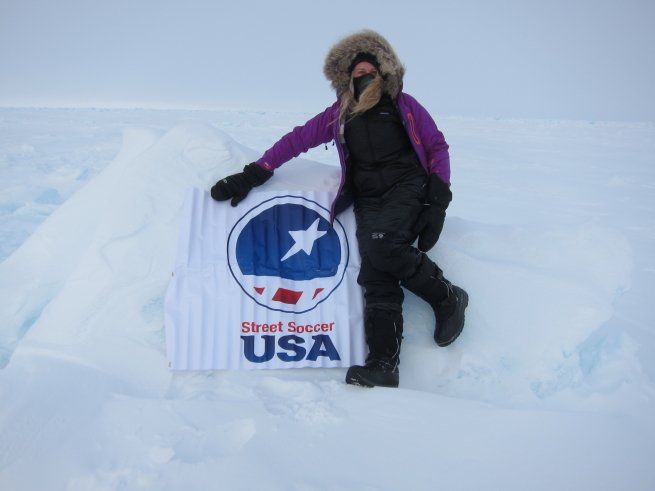 The northernmost point on Earth found at latitude 90 degrees North. 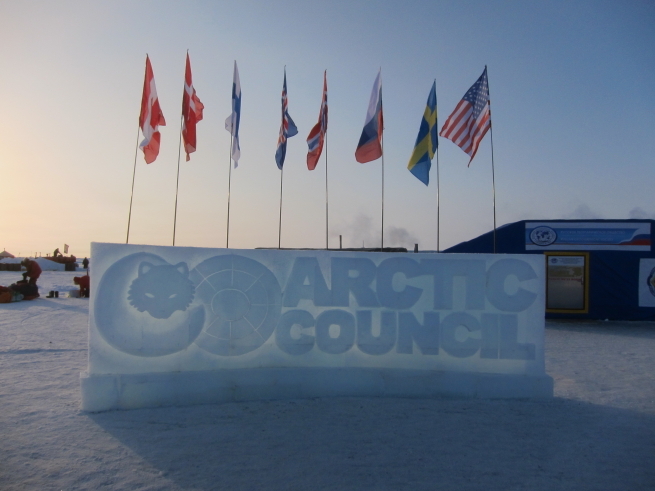 The Arctic can be defined as ‘all of the earth north of the Arctic Circle’ which is located at 66 degrees, 32 minutes North Latitude. 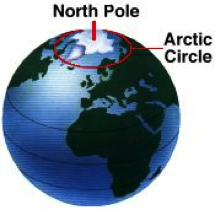 The North Pole is the northernmost point on Earth and is found at latitude 90° North. Poetically it is where all meridians of longitude meet and the only direction is south. 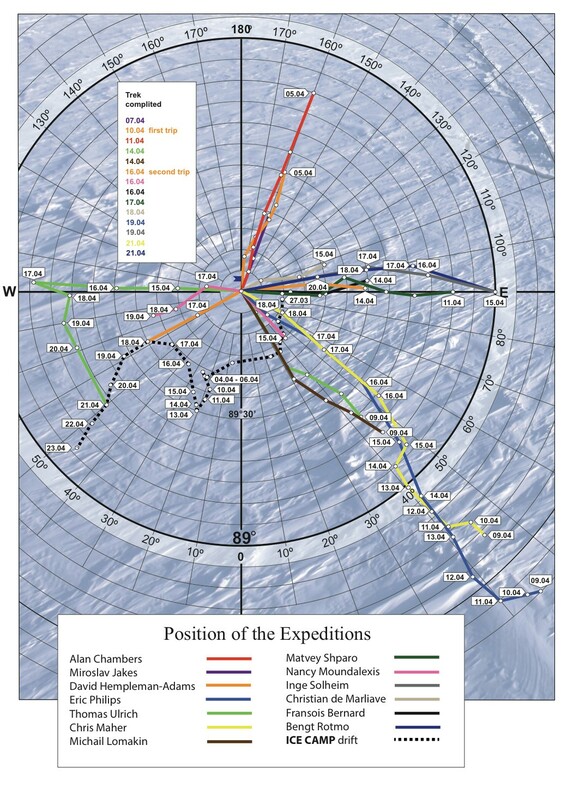 At the North Pole literally all directions point south; all lines of longitude converge there, so its longitude can be defined as any degree value. The North Pole is located in the middle of the Arctic Ocean amidst waters 4,000 meters deep that are almost permanently covered with constantly shifting sea ice 2-3 meters thick. 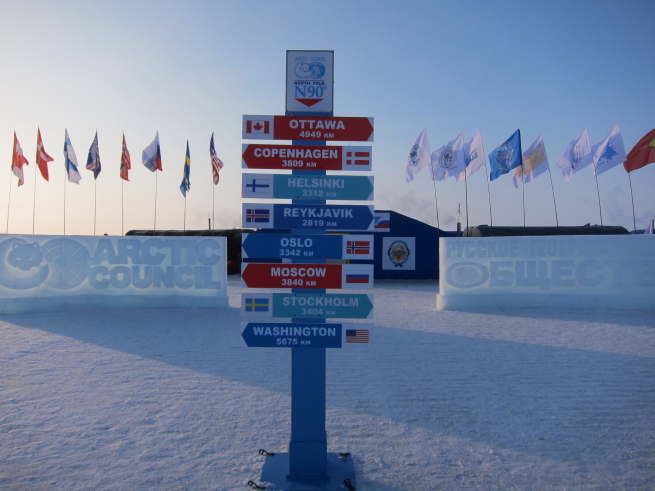 The Arctic Ocean is surrounded by Alaska, Canada, Greenland and Russia. In the summer months the temperatures are near 0C and there is 24 hours of daylight. 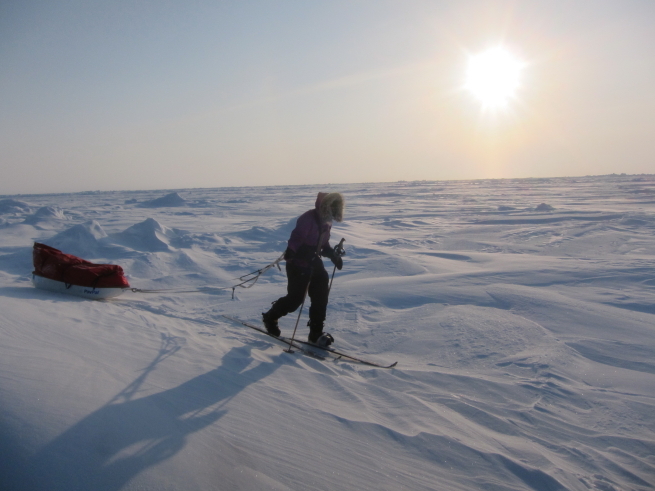 In the winter the temperature is -30C and it is dark 24 hours a day. 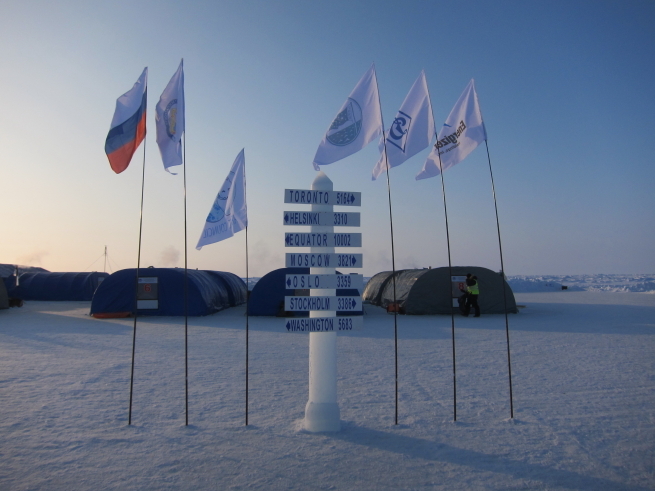 For 21 days a year the Russian staff from Khatanga in Siberia set up a base station near the North Pole called Barneo. It takes about three hours to get to Barneo from Longyearbyen but once one does the journey begins. 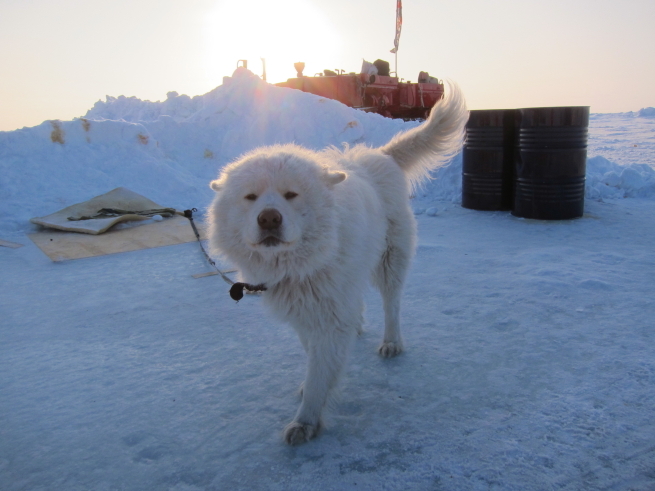 Barneo drops guests off at 89 degrees so that teams can begin to pull sleds and ski towards the North Pole in order to complete the last degree program. The journey is 60 nautical miles or 111km. 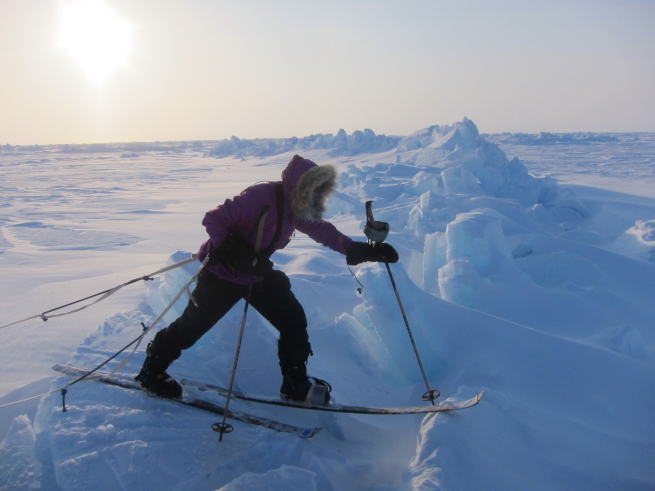 Throughout the day groups will encounter a mixture of ice fields, pack ice, thin ice and leads with temperatures in April adjusted for wind chill between -25C and -35C. Borneo coordinates: N 89 ˚ and 31 ˚ W 084 42. Weather: Temperature -27 ˚ C, wind 6 m / s, clear. Removal from the pole 50 km. The drift of the south-east, 0.3-0.5 km / h.
On the basis of 22 tourists. Took two An-74 flights from Longyearbyen. “The first flight of AN-74 landed on Borneo at 8:30 am, arrived just 4 groups of skiers (guides Borge Ousland, Alan Chambers, Doug Stoup and Gvendt). 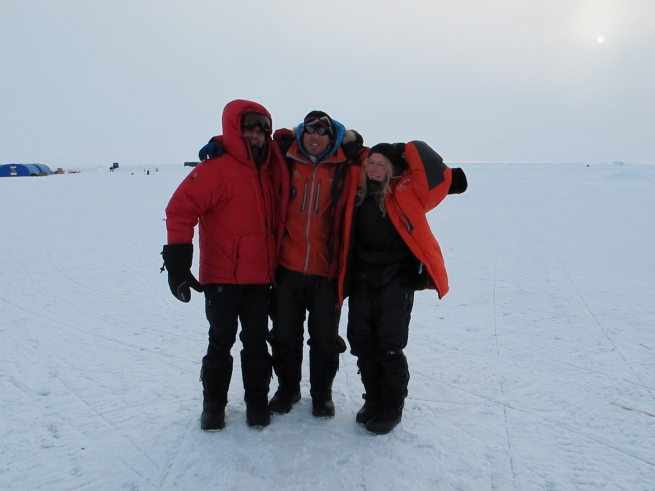 Chambers Group, Stupa and Gvendta after breakfast and packing sledges were abandoned at the last degree and a group of Borg – a distance of 25 km from the North Pole. At the same time planted the pole group Greenpeace (guide Eric Phillips). 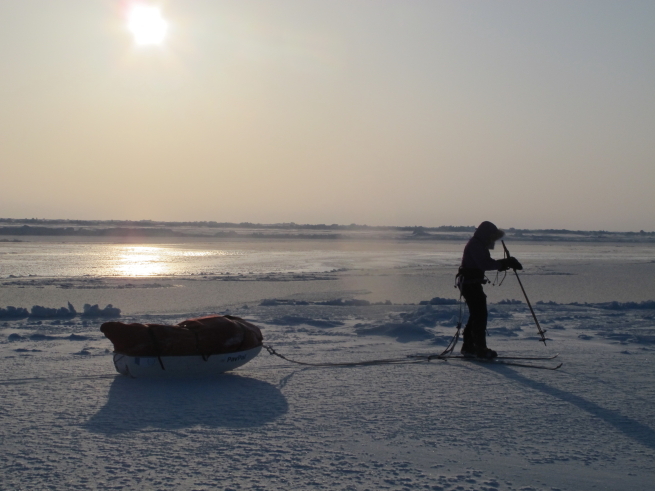 Return to camp with the pole removed 3 groups who have successfully completed their expedition (Michael Lamakin guides, Rick Schweitzer and Miroslav Jakes). 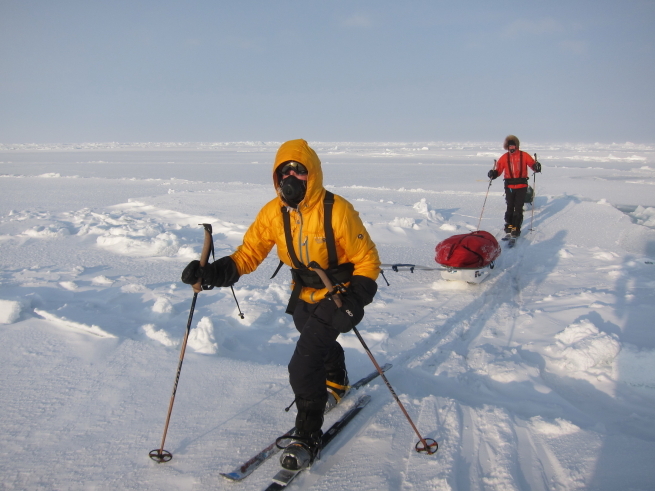 Jakes with British skiers took almost a feat – there were two degrees for 10 days, though – with the associated drift. In camp all were awarded certificates, including a five-year Gwendal, the youngest conqueror of the pole on skis! He was presented with another brand and a teddy bear. 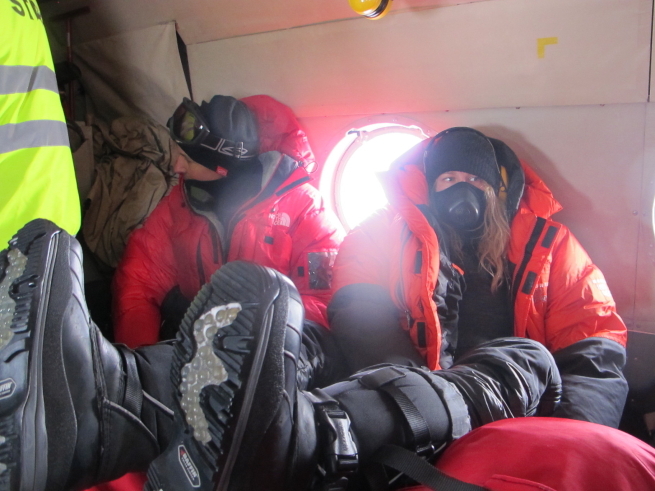 Also on the first flight arrived in camp expedition of French scientists (ZH-K. Gaskard). They plan to install three buoys near Borneo. Evening flight to our hospitable floe profits British scientists (PF Worcester), and on the return trip “to civilization,” shot went with the ski pole group, and Oscar Grooms with Vladimir Zaitsev, who have completed their mission to support the expedition of Fyodor Konyukhova and Victor Simon in Greenland. Borneo coordinates: N 89 ˚ and 10 ˚ W 66 34. Weather: Temperature -21 ˚ C wind 4 m / s, pressure 762 mm Hg, visibility 10 miles. Removal from the pole 92 km. “The weather improved. Despite the setback, the cold is better tolerated than yesterday, because of the weakened wind. Vladimir Sevastyanov the mornings lecture about polar bears in Russian. Tourists very impressed by what he heard off in search of the owner of the Arctic in the next hummocks, but to no avail. 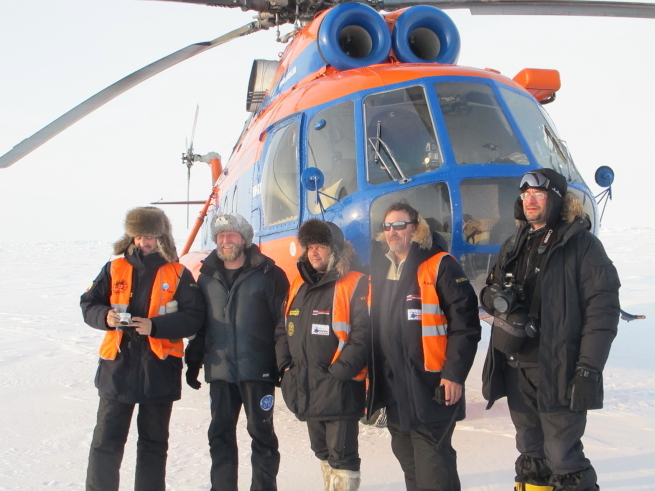 For lunch, the An-74 flew from Longyearbyen with Norwegian and Chinese guests on board. 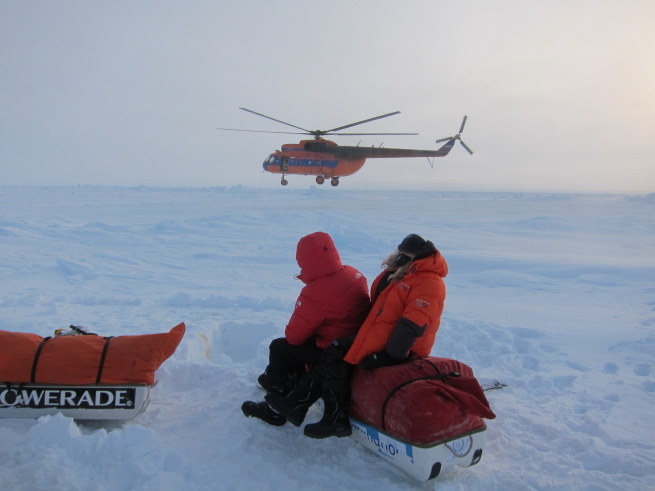 After exploring the camp, they went by helicopter to the route (guide Michael Lamakin). 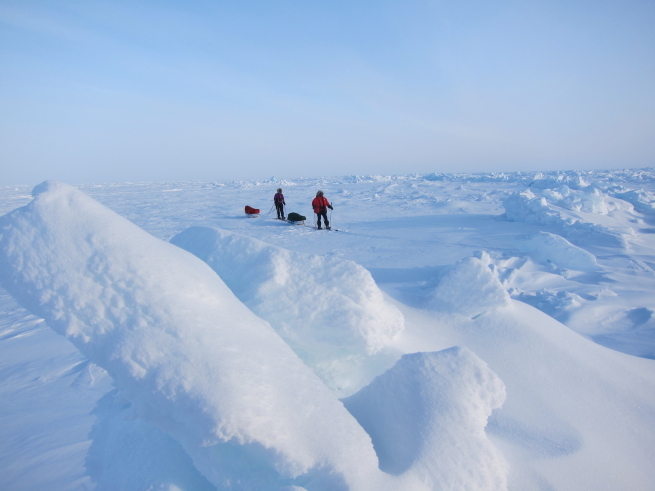 On the way back from the pole removed two groups who have completed their program (guides Doug Stoup and Bendt). 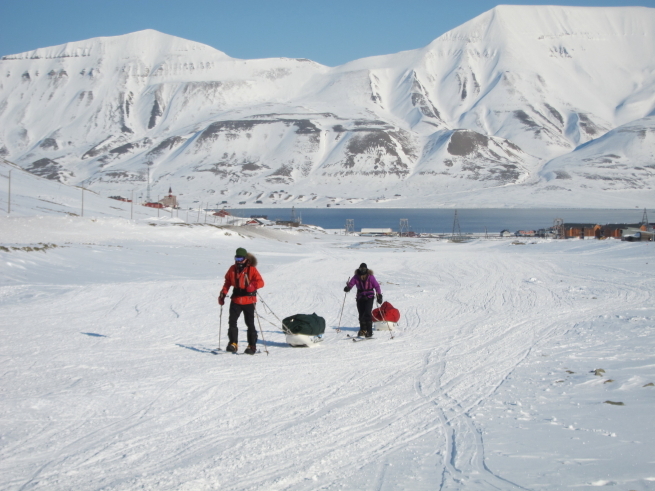 Of the tourists immediately flew to Longyearbyen.